Product prices and availability are accurate as of 2019-04-24 00:49:24 UTC and are subject to change. Any price and availability information displayed on http://www.amazon.co.uk/ at the time of purchase will apply to the purchase of this product. Official HBO Licensed Product. Small A5 steel tin sign from the hugely popular Game of Thrones range. 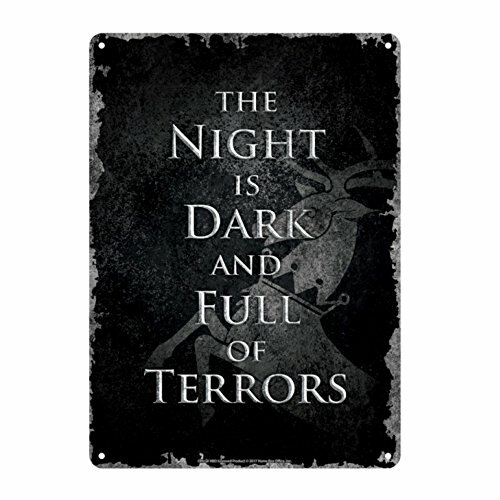 All worshippers of the Lord of Light should keep this sign in a well used room as it features the famous first line of their prayer, "The night is dark and full of terrors", often heard spoken by Melisandre the Red Woman. Has pre-drilled holes ready to hang so perfect for adding a little style to any door or wall. Sign measures approximately 21cm by 15cm. A fab gift idea for any Game of Thrones fanatic or add to your own collection.